Olino is a family-owned specialist supplier of airline uniforms and related products and services. From our headquarters in Odense, Denmark, and our uniform center near Copenhagen Airport, we serve more than 30 aviation customers worldwide. Our history dates back to the early 1930s, when a company with roots stretching back to the nineteenth century began producing linen and was named the Odense Linen Factory. In 1957, the Odense Linen Factory was acquired by Mr. Rudolf Rasmussen, who changed its name to Olino and began producing women’s workwear and clothing. In the 1960s, Mr. Rasmussen's son Paul Gram joined Olino and they transitioned the production from women’s workwear to women's clothing, particularly dresses. In 1971, Olino was acquired by Mr. Paul Gram, who changed the company name to Olino Konfektion. The Gram family began transforming the company into a highly specialized supplier of airline uniform solutions in 1982, supplying large Northern European companies such as SAS, ISS and Aral. The company’s name was shortened to Olino in 2009, and we have now grown to become a market leader in our demanding field. Olino is still controlled by the Gram family, and as a privately held family-owned business, we are fully independent of all suppliers and airlines. 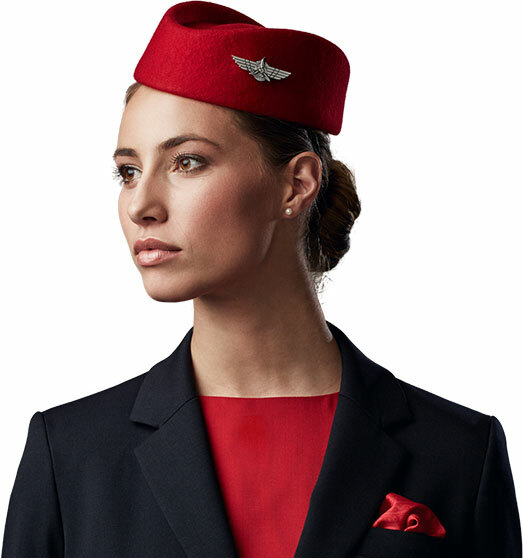 First class service - Our total service business model offers a convenient and cost-effective way of outsourcing all your flight deck and cabin crew uniform needs to a single supplier. First class quality - Our personal involvement in every step of the process ensures consistent first-class quality from design, development and manufacturing to stock management and wearer services.